Since my institution has started using WPMu for faculty and departmental websites I had better have a look at this from bavatuesdays (which came to me via Stephen Downes). 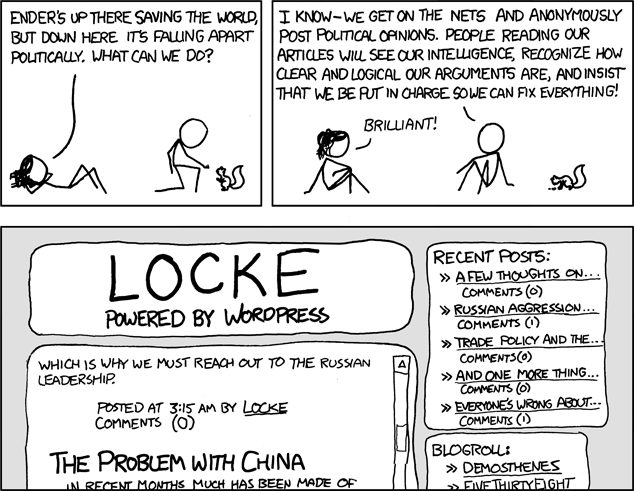 xkcd – A Webcomic – Locke and Demosthenes. Inventing cute mnemonics is fun, and the process of inventing and checking them may help reinforce the definitions, but beyond that they really are useless – and I believe they do more harm than good when people actually try to use them. It takes much more time (and mental effort) to correctly recall and decode one of these than anyone who needs to use the terms can afford. And there is a much better way. You are currently browsing the alQpr blog archives for October, 2009.